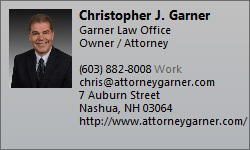 If you have been injured in a car accident, on someone else’s property or in a work related accident please call (603) 882-8008 or contact chris@attorneygarner.com to schedule an appointment today to learn more about how we may be able to help you. Nashua, New Hampshire and statewide injury lawyer and workers compensation attorney providing advice and representation for all automobile accidents, motorcycle accidents, wrongful death cases, slip and fall, premises liability and work accidents and injuries. Get help in navigating the insurance bureaucracy, dealing with insurance adjusters and obtain personalized, experienced counsel to negotiate a fair settlement and bring your case to Court when necessary. 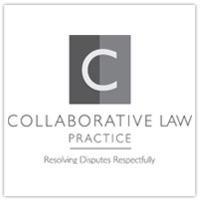 There is no fee earned until you receive your fair compensation.